I have lived in the United States for one and a half years. I live in D.C. with my parents. I go to Woodrow Wilson HS. At first, I was afraid to go to school because I thought I couldn't understand what people were saying. But all my teachers were nice to me because I'm good at math. They helped me learn English too. After one year, I can handle stuff all by myself in the school. Sometimes, not everything is perfect. My English teacher makes me feel sad. I want to challenge myself, so I want to take AP English next year, but she said I'm not good enough to switch out of the ESL program. One issue in our school for ESL students is the classes. Students are limited when they're choosing their classes. The ESL teachers choose most of the classes and students can't really take the classes that they want. I'm going to take pictures about their schedules, their classes when they're taking the subjects that they don't like. I want to show the photos to our principal and ESL teachers and leaders so that we can have more choices. I am part of this program called SMART. SMART is made up by MLOV. MLOV stands for Many Languages One Voice. 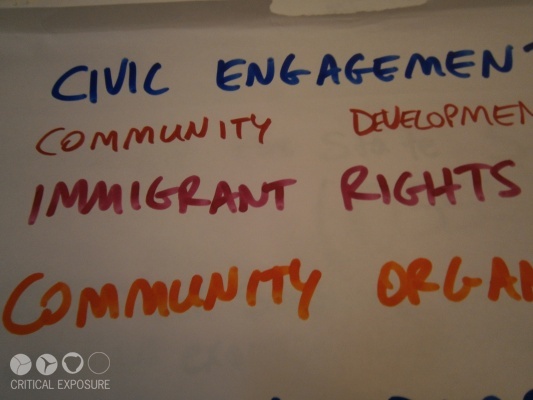 MLOV helps immigrants with issues that they face in order to make them have better lives. This photo is to show what the SMART team is working on. This photo was taken during our class. I took it because it shows the issues that we are trying to fix. This year SMART leaders are working on getting culturally sensitive school lunches, interpretation and translation for students and parents, and closing the divide between ELL students and American students. I believe other people should see this photo because it gives you an idea of what immigrants face in life and what they have to do to make life better. 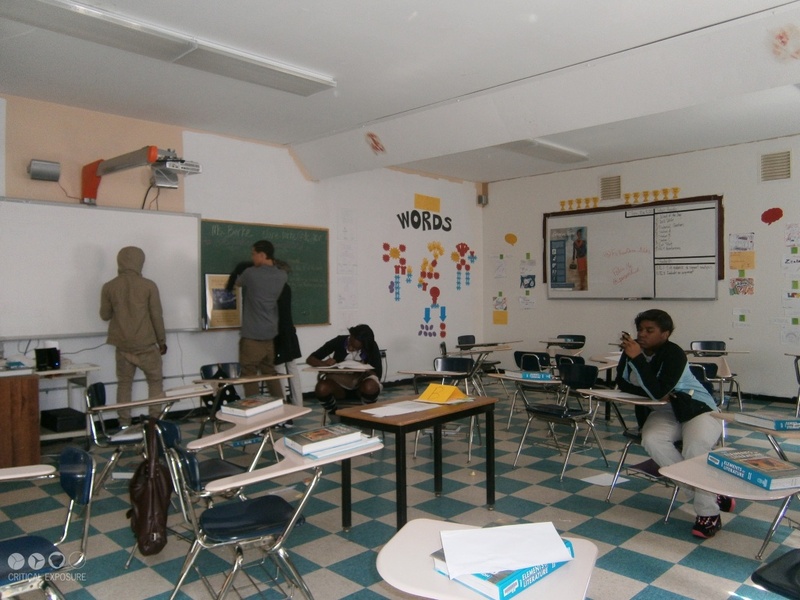 This photo shows that the students don't respect the teachers and some students are playing around in the class. In my English class, we are six students. But the students aren't interested in what we learn, they just want to have fun. Sometimes my teacher gets mad and doesn't feel like teaching. She should make her lessons harder or have more rules -- it might help her. The class is too boring. Some of the students sleep because they might not understand English. Also they can't recognize what the teacher is talking about, so I think this picture shows that in my school they don't have translation and interpretation. That's why ESL students get confused in class. 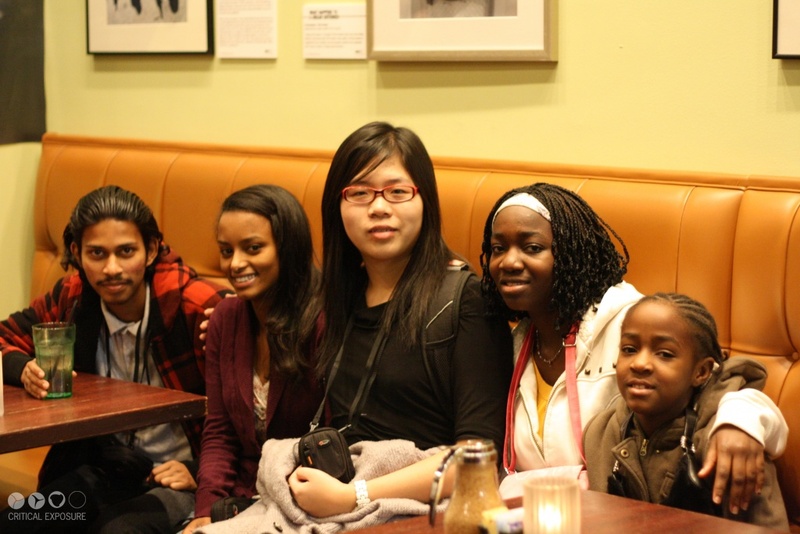 Editor's Note: Critical Exposure's MLOV students attend a Critical Exposure exhibit opening at Busboys & Poets. As an ESL student, I have been witness to how students go through ESL classes. This photo shows newcomers in Theodore Roosevelt SHS. As I show in the photo, in many classes there are few students. These students do not get enough information about school because of the lack of understanding of the new language. They also can't get involved in school activities until they master the language. In this process, they miss a lot of information and opportunities to fully enjoy high school. 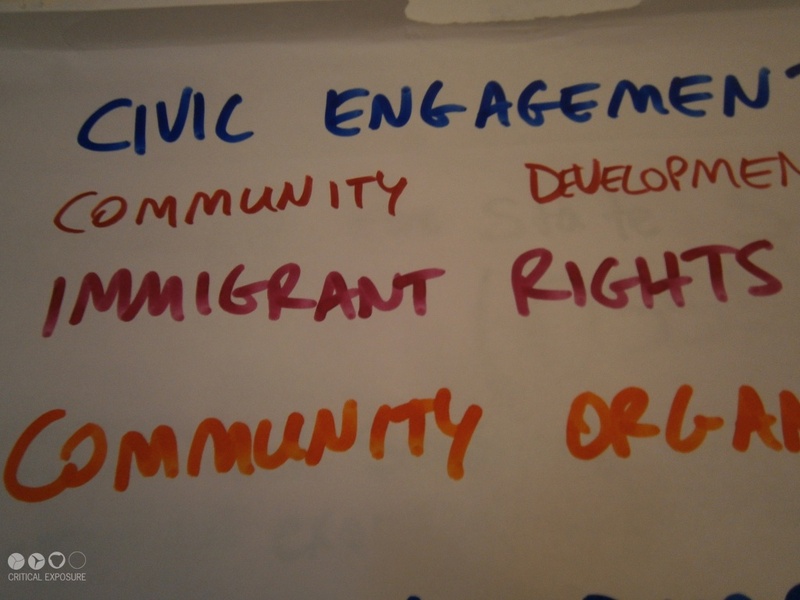 I hope to see more support for ESL students in the future. Being an immigrant and not knowing English is the most horrible thing, because a lot of people take advantage of those people who don’t know English. Some people feel like they don’t know how to do anything, because other people tell them that they are ignorant. In our countries, there is a lot of poverty and the majority of people come to this country because it is called the country of opportunities. But because of the discrimination in this country, many immigrants go back to their countries. 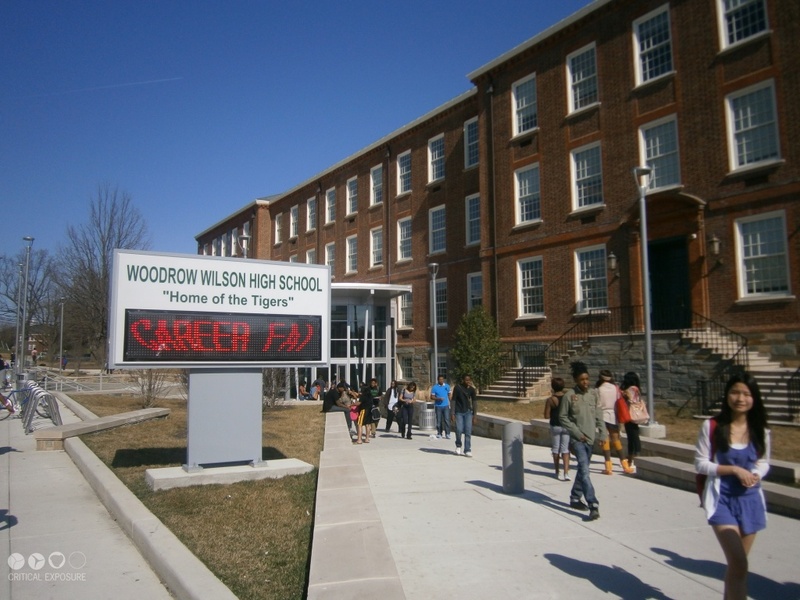 One of the things that is affecting the schools in the District of Columbia is discrimination. 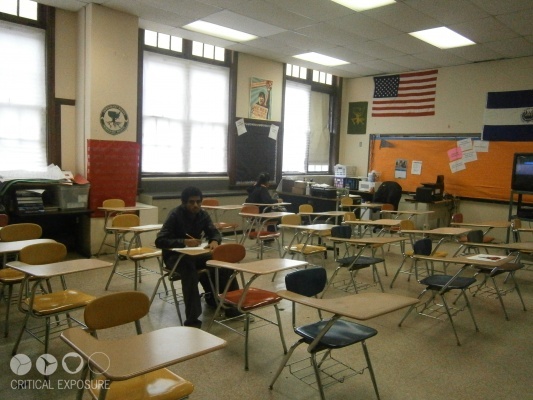 Many of the African American students say that they are better than the Latino students. However, I believe that in this world we are all equal, no matter the race, the culture, or the language. 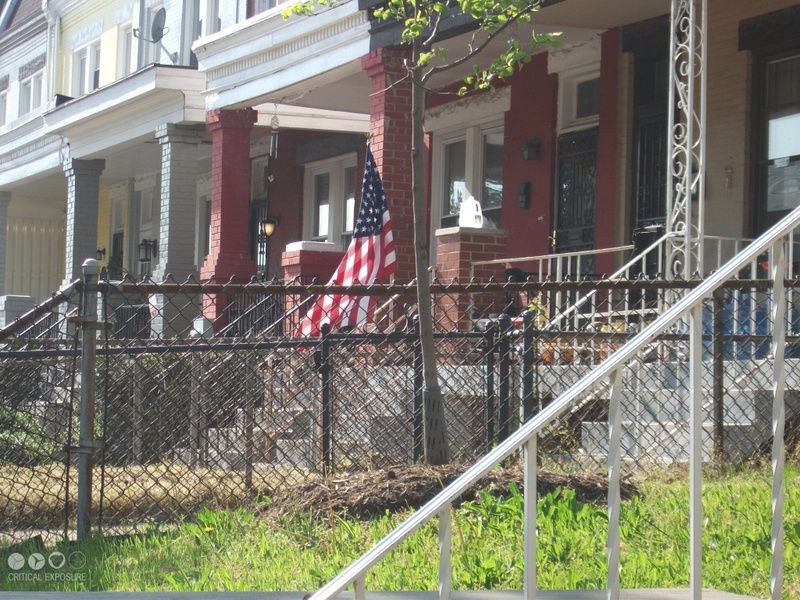 Many students, especially Latinos, stop going to school because of the discrimination. I have seen many cases in which other students and even teachers have discriminated against students. This makes me feel disappointed because our teachers are in the school to teach us and not to discriminate. This also makes me feel disappointed because we are all humans. We all have skills, we are all intelligent, but over all, we all have feelings. I would like to not have discrimination or racism in this world and that we all treat each other the same way.